3. Hats with codes starting with DHB and DHBB are new stock with stiffer brims than code DH. Measurements are approximate as hats are handmade. Slight variations may occur. Actual measurements may vary slightly from style to style as all hats are handmade and also depends on placement when worn. If a SIZE is not shown on our website it means that size/colour dog hat is either out of stock or the colour is discontinued. You can use "Contact Us" to enquire if this colour/size dog hat is still available. Orders take approx 7 -14 days. 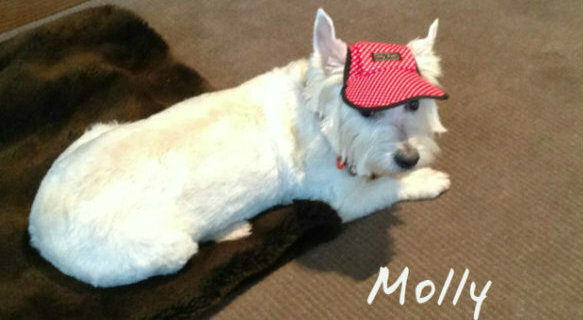 Contact us for 'custom brim length' orders for dogs with skin cancers (custom fee applies). 1. Draw a circle on paper. The diameter of the circle should be the BRIM WIDTH measurement given for the dog hat size you arechecking. 2. Cut out the circle and fold it in half. 3. Place the folded edge just above the dog's eyebrows. 4. Although the brim shape will be different you can then see if the hat is wide enough to cover the eye area. 5. Check the brim length indicated for the size you are checking - it will be different to the paper circle's measurement. 6. If you have questions please "Contact Us" for assisstance. RECOMMENDED HAT PLACEMENT: The hat seamline (where the brim and crown join) should sit just slightly above the 'eyebrow' area of the dog so that the brim will shade the eyes. The elastic strap at sides should be halfway between eyes and ears for comfort. Above: Bindi, showing how hat is designed to sit and where straps go. Above Left: Hat is designed to be worn like this. Above Right: Hat brim could be pulled further forward - but go with your individual preference! Below are pictures of another Molly, a Border Collie, in MEDIUM and LARGE. Medium size the strap is fully extended. Large size gives more shade to eyes and dog seemed much more comfortable. Remember that all dogs vary in size within each breed. As we cannot see your dog, we suggest making the paper template as described below. MEASURING BRIM WIDTH: Some dogs may fit between sizes. If trying to decide between two sizes, we suggest the one that gives most shade to the eyes, but it it entirely up to each customer. Molly (pictured) is a Border Collie and whilst the MEDIUM is OK, the strap was fully extended and she seemed more comfortable in the LARGE size. 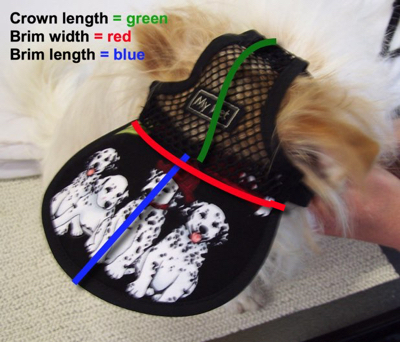 MEASURING BRIM LENGTH - brim length is quite generous but for dogs with skin cancer, custom made brim lengths are available ($10.00 surcharge) The length should not impede the dog vision, drinking, eating, sniffing. This means it should preferably NOT be to the very tip of the nose as this would cause the hat to hit the ground when the dog sniffed anything - but this is up to the customer. Most times a custom made brim length is not necessary, but check with your Vet. Photos of Molly, a Border Collie, showing difference between two sizes - MEDIUM (top photo) and LARGE (bottom photo). Although the MEDIUM fitted her, Molly seemed more relaxed and comfortable in the LARGE size which also gave much more sun protection to eye area at side of face. However, if this was for a working dog who needed to constantly look up to see their handler's commands, the MEDIUM might be the better choice. But as all dogs vary in size within each breed, customers should follow their instinct. But if you DO order the wrong size please let us know and we will help. If you have questions, just email us and ask.